The last time I went camping I made sure all my food was in packaging that could be opened by hand. It’s kind of a bummer when you can’t open that package of food without wasting half of it. A can of chili really splatters after that third hit from the cinder block. P-38 can opener. They’re cheap – and easily lost. 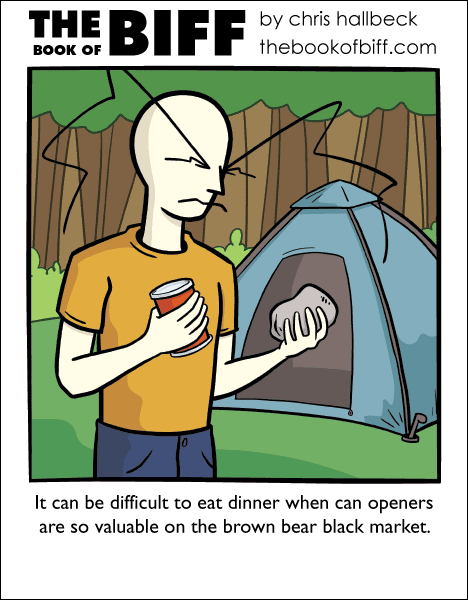 You should always have a swiss army knife on you when you go camping. Pick-up trucks. They open more than beers. 1: Lie the cinder block flat. 2: Place can end-down on the cinder block. 3: Using firm pressure, grind can across face of cinder block. 4: Continue until rough surface of cinder block has ground the end seal off can. 5: Tip up cinder block and can (to prevent contents dropping out of can) and turn can upright. 6: Wipe metal shavings off end of can. 7: Empty can into pan. Cook. Eat. I keep one on my keyring at all times. Along with a churchkey opener (actually half of a folding churchkey/bottle opener) and a old promotional Nokia bottle opener. The P-38 is a genuine little miracle and has come in handy on many an occasion. Had this one for years. I always have a knife in my pocket.